Hyundai is going all out for Super Bowl XLVII this weekend, with five new commercials to air during game time - three of which are for the Santa Fe. One includes legendary rock band The Flaming Lips and a song they've produced for Hyundai titled Sun Blows Up Today. The band is featured in one of the five commercials, called Epic Playdate (see below), which features a family engaged in a day of hilariously fun activities - all based on Flaming Lips songs - while the Lips play in the background and make cameos throughout. Best of all, the exclusive song is available for free download to the first 100,000 Hyundai fans who log into Hyundai.com, starting today. As of this writing, the song was still available as a graphic link on the front page. If you don't get it there, it is also on iTunes and will be a bonus track on the band's upcoming album. 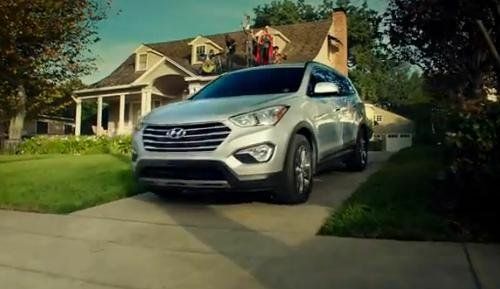 Epic Play Date will air during the pre-kick time slot and, like two of Hyundai's four other commercials for the big game, features the all-new, 7-passenger Santa Fe. Other Santa Fe commercials include Team, and Don't Tell (below). Two other ads are for the Genesis and Sonata.